When I decided to take PediNotes to market, some asked why would I want to enter such an arena. The philosophy after all almost dictated that hospitals use just a single software platform and the market was already dominated by large software corporations. For me, the answer was easy: Existing software products did not offer features that focused specifically on neonates and older infants. My patients were definitely not a priority for major hospital EMRs. I get it. Our patients make up a smaller portion of the health care visits and dollars, and except for children’s hospital, adults have always been the focus of most institutions. It wasn’t until the 21st Century Cures Act was signed into law in December 2016 that the federal government recognized the unique IT needs of children. PediNotes was designed by a neonatologist (me) along with an accomplished group of software developers. We started by writing add on programs to improve existing neonatal software. When that was no longer enough, we decided to create PediNotes with the two “must have” caveats - interoperability and data analytics - before we would make it public. Our interoperability approach allows us to take information from multiple sources and present it in a way that is intuitive and useful to clinicians. More importantly, we can work within existing hospital EMRs and our users’ work in an environment to create a workflow that’s conducive to better care. For physicians like me that work in different hospitals with different EMRs, being able to work in PediNotes in each of those hospitals makes life easier. It goes without saying that the majority of neonatologists like data, and they want the data quickly (e.g. as soon as the question is asked). I spent many years asking my software developers to write queries to get the clinical data out for us to use. With PediAnalytics and data warehousing, those requests are now few and far between. PediAnalytics is a simple tool that returns very complex data. PediNotes’ data warehousing is even more powerful and coupled with Microsoft’s PowerBI, allows data analysis from multiple data sources such as the hospital EMR and other neonatal software that you might be using. Data is meant to be shared and PediNotes has the tools to do it. The one-button data extraction of Vermont Oxford data is a great example. We are proud of what we are doing at PediNotes and truly believe this tool is improving the care of our patients. I would be happy to show it to anyone who has an interest in what we are doing. Greetings from the PediNotes® team! Through our blog series, we share the many efficiencies PediNotes has created for users and how it has allowed them to work the way a clinician works. One of most raved-about features in the PediNotes patient list is the availability and functionality of visual keys. These clearly visible icons make actionable patient information easy to locate, saving the user time and increasing workflow efficiency. This feature also alerts users the moment data becomes available. This allows medical professionals to view patient statuses in real-time. For example, rather than having to check for new lab results with the laboratory or nurse, a red “L” automatically appears next to the patient’s name to inform the clinician of the results’ availability. When a patient is admitted to the hospital, their name, along with pertinent admit information, is immediately added to the “Pre-Admit” section of PediNotes. The visual keys also allow users to quickly access basic patient information. Simply hovering over the patient’s name brings up assignment information. This care team information includes the attending, physician, nurse practitioner, resident and nursing/respiratory therapist assignments. The mother’s information is also available through the same hovering functionality. Finally, the visual keys are critical for communication with the care team. A patient that has been rounded on can be identified quickly with the green check mark icon. This has proven to be particularly useful in large units. Patient checkout/sticky notes are yet another visual key that can be used in care team communication by leaving messages that appear as a notepad adjacent to the patient’s name. 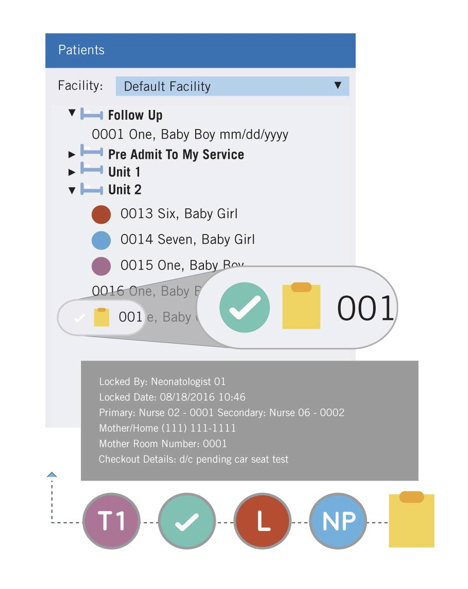 The patient list’s visual keys are just one of the many ways PediNotes was designed to work the way you work. Stay tuned for our next post where we will deep dive into how PediNotes notifies users of data availability in real-time. Feedback on this post? Write to us on www.PediNotes.com! Welcome to the first posting in our new PediNotes® blog series! We’re excited to share the many ways that PediNotes® has made its users more efficient and demonstrate how it works the way a clinician works. One of the most powerful features of PediNotes® is its ability to create customized screen views based on user preferences. Users can design any screen layout that works for them, allowing them to adapt PediNotes® to work the way they work. With the Multi-Screen View function, users can open multiple patient screens and arrange them in any order or size. This function works on multiple standard monitors or a single widescreen monitor. Selecting a new patient updates the information on all screens, thus eliminating the inefficiency of switching back and forth between views simply to view/update critical patient data. The different views allow users to work in an environment that fits the task they are performing. Designing a custom window layout is just one way PediNotes® works the way you work. In our next post, we’ll explain how PediNotes® visual keys allow users to control the entire unit at their fingertips. Connect with us at www.PediNotes.com!